Status of the usage of the ZIMcast Station. Complements of the new year from everyone here and again thank you for your efforts towards our acquiring of the EUMETCast Receiving Station. Our station is very much fully operational and like you rightly pointed out, we are still exploring and learning a lot about the capabilities of the station. The quality of the signal is ok it averages around 53 %. We are also receiving the EO products in good order. The products from the station are already being used to teach certain modules like applied remote sensing and practical components of modules like natural resources management, Hydrology, climate change, environmental impact assessment etc. We are still exploring ways of using the products in other modules across the University. So far we have had five undergraduate students doing their dissertations using mainly products from the EUMETCast station. 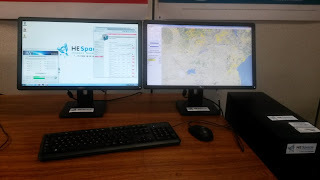 To date we also have done capacity building and awareness of the EUMETcast station and its products around the south eastern parts of Zimbabwe, since it is the only station installed outside Harare. In capacity building, we managed to orient and train members of staff from the Sustainable Agriculture Technology (SAT) on the use and station products. We also want to orient and train some members of staff from other faculties in the University on how they can use some of the products from the station to enrich their research activities. As a department we are also in the process of coming up with products and monthly bulletins that that will be published on the University website. The products will be relevant to the community, farmers and industry e.g. fire monitoring, fire risk assessments, drought monitoring, flood hazard monitoring, agriculture and rangeland monitoring. The system at GZU is fully operational, it is receiving and visualizing products. There was an issue of signal quality, which was a bit low after installation (we got 52% at installation and now it fluctuates to around 30%), but a permanent signal lock is still achieved. After tests at BDMS we have discovered that with the new DVB cards the best signal quality reading we can get with the antennas we use is around 50%. At BDMS the signal is also around 30%, but the SADC-THEMA staff have discovered that it is due to interference from their wimax, and nearby radio sources. When they switch off their wimax the signal quality improves a lot. The LNB installed at GZU is called a "One Cable Solution", it has two oscillators on-board at 700MHz apart. The tests at BDMS revealed that when you switch to the higher oscillator then our signal quality improves from 30% to 52%. This proves that there is interference at the normal oscillator frequency. There was a national training in Zimbabwe on 20-24 July and GZU lecturers participated at that training (as trainers). BDMS is expecting the v2 of the fire terminal to be released by CSIR soon, they will present the software at the MESA Forum in Nairobi this week. A stable tested version should be available within the next two months, so the MESA SADC-THEMA staff will go and upgrade the system at GZU to the new version in November (or end of October). When they do the upgrade, they will also switch the LNB to the higher oscillator to boost the signal quality. From Monday 20 July 2015 to Friday 24 July 2015, all users in Zimbabwe will be trained in the usage of the MESA SADC THEMA products and services. All experts from Zimbabwe with an interest in GIS and Remote sensing are welcomed. Users from the National Meteorological Services (NMS), the Scientific and Industrial Research and Development Centre (SIRDC) and the University of Zimbabwe (UZ), the Environmental Management Agency (EMA) and the Greater Zimbabwe University (GZU) will participate. The training takes place in Harare. 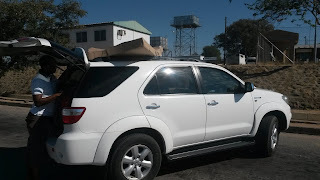 On Wednesday 13 and Thursday 14th of July, staff from the MESA-SADC THEMA visited the GZU in Masvingo to install the EUMETCast receiving station. Hereafter are some pictures of the installation. 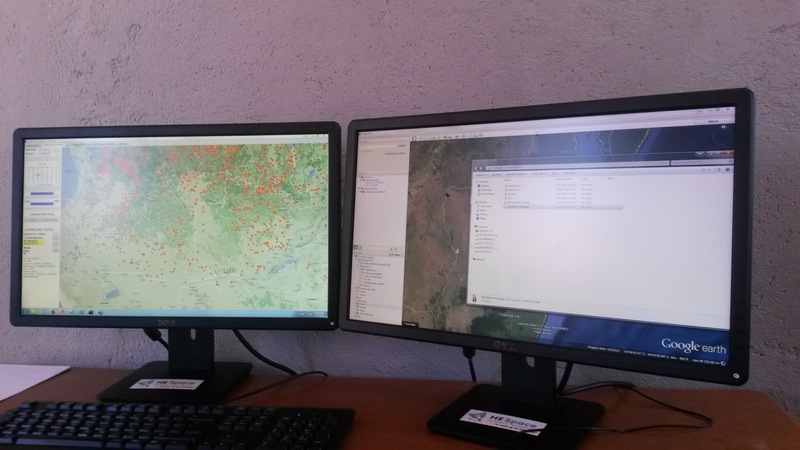 All software was installed on the EUMETCast receiving station in Gaborone. Hence the factory acceptance took place. Then the receiving station was driven from Gaborone to Masvingo by MESA-SADC THEMA staff. Then the site was inspected. The pole was already erected by GZU staff on a solid concrete base. And the antenna dish was erected. It is a 2.4m mesh antenna. And a coax cable connects the antenna with the indoor equipment room. Positioning the antenna to the Atlantic Bird 3 satellite, and fine-tuning the position to maximise the signal strength. Building up the indoor sub-system. The other screen is used for running GIS applications, so for the actual work. The Active Fire Information System (AFIS) on the left. When everything is installed and working, it is time to sign the "Acceptance" papers. By signing these papers, GZU acknowledge to have received a EUMETCast receiving station. And the day was finished with a demonstration for the dean of the faculty and the GZU lecturers. Many thanks to Thembani Moitlhobogi and his colleagues of the MESA SADC THEMA for the good work. 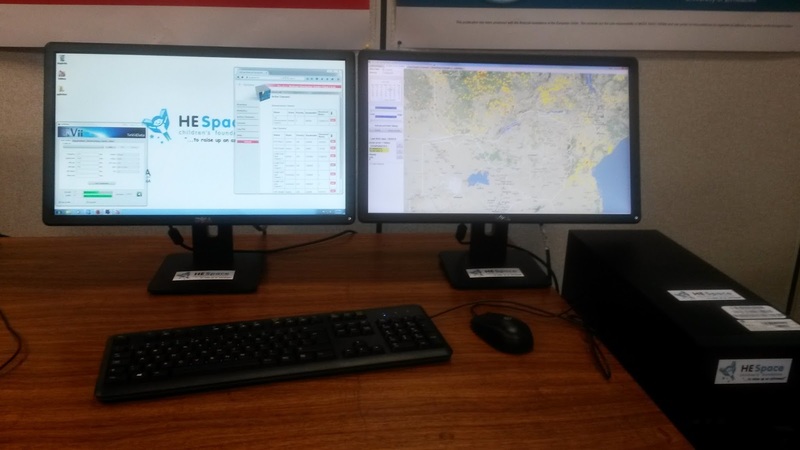 The EUMETCAst receiving station was succesfully installed and tested on Wednesday 15/7/2015. The GZU (Greater Zimbabwe University) has finalised and submitted the "site conformity checklist". As such, GZU is fully prepared for the installation. The installation dates are confirmed, and the installation will take place on 13-15 July 2015. On GZU side, Mr A Chikomba, Mr Shambira and Mr Mawire will be on standby to assist. The receiving computers were delivered to the SADC THEMA in Gaborone/Botswana on Friday June 19th. The SADC THEMA staff can now complete the last preparations. They need to install, configure and test the software for the new hardware in Gaborone/Botswana and prepare/adapt the documentation. The SADC THEMA has also requested to get a tax clearance for the equipment from the AUC in Addis. They need this paperwork in order to cross the border while transporting the equipment from Botswana to Zimbabwe. They have submitted the request for gift certificate, and they expect the documents in the next week or so. So, the installation of the receiving station in Masvingo is now provisionally planned on 13 - 15 July 2015. (To be Confirmed) BDMS will communicate the proposed dates to GZU this week, once the dates are confirmed. The SADC THEMA are now making all the necessary preparations in order to meet the above stated dates. The software running on the station will be be the AFIS Fire Terminal (as was for AMESD). The new AFIS fire terminal (Linux, web application) is foreseen to be released only at the end of August. For now, BDMS will install the old AFIS terminal on Windows 7. For data management, they will use EFTS Agents from EUMETSAT. Once the new AFIS terminal application is released (by CSIR/South Africa), an SADC-THEMA engineer will go over to Masvingo (Zimbabwe) again to install the upgrade and to train the users.